This is the third book in the series on The Waterloo Archive expertly edited by Gareth Glover. The previous books, Volumes I and II are reviewed on the Napoleon-series website by Bob Burnham and can be found under the Reviews Section. The two reviews contain more information on The Waterloo Archive series which would be repetitious to include in this review. Volume III contains a “Forward” by His Grace the Marquess of Anglesely, “Acknowledgements”,” Introduction”, 135 letters, “Bibliography”, “Index of Correspondents”, and “Index of Officers and Places.” The illustrations consist of eight colour plates and one black and white illustration. All the letters were carefully chosen. The volume is extensively footnoted and Mr. Glover has taken great care to identify persons referred to in the letters as well as to try and confirm events mentioned. 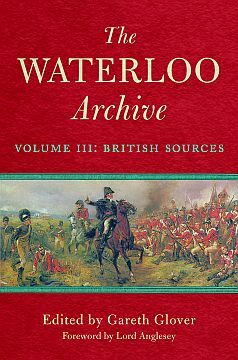 The Waterloo Archive, Volume III continues to support Mr. Glover’s efforts to present, “Previously unpublished or rare journals and letters regarding the Waterloo campaign and the subsequent occupation of France.” As with the previous volumes, the letters are arranged in the same manner as Mr. Glover’s Letters from the Battle of Waterloo which followed the arrangement in Siborne’s original The Waterloo Letters. This makes it very easy to cross-reference the letters for all of these works. The letters themselves cover both pre- and post-Waterloo, as well as the battle. The volume has many gems. One for me is the confirmation that Lieutenant Colonel and Brevet Colonel Joseph Muter, 6th Dragoons, recovered from his Waterloo wound in time to resume command of the 2nd (Union) Cavalry Brigade until the army was broken up. Another is the speculation by an artillery officer that the Duke of Wellington would ignore senior artillery officers, as he had done in the Peninsula, and again chose his own commander of the artillery for Flanders. Volume III is a worthy addition to the history of Waterloo and 1815. Highly recommended.